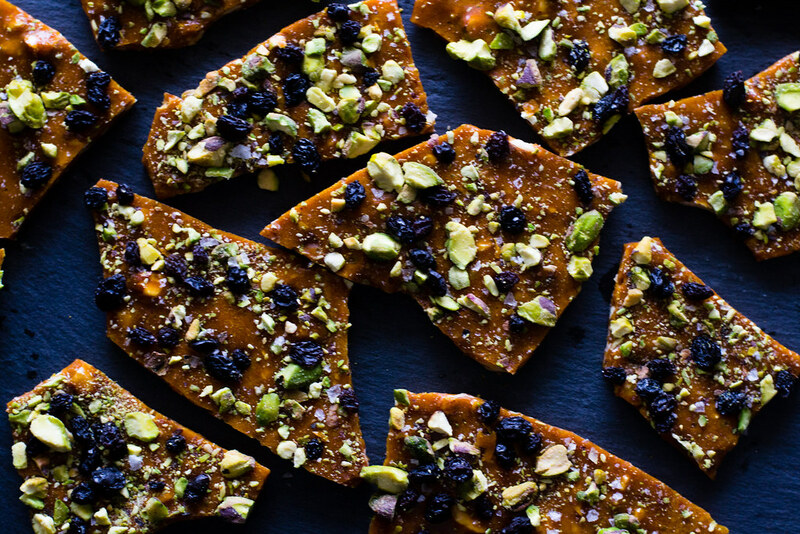 Right when a friend shared this amazing pistachio brittle recipe from Bon Appetit on Facebook, I couldn’t help but not make it. Besides being impulsive both inside and out of the kitchen, I managed to watch, cook and eat this recipe within 24 hours of first watching it. 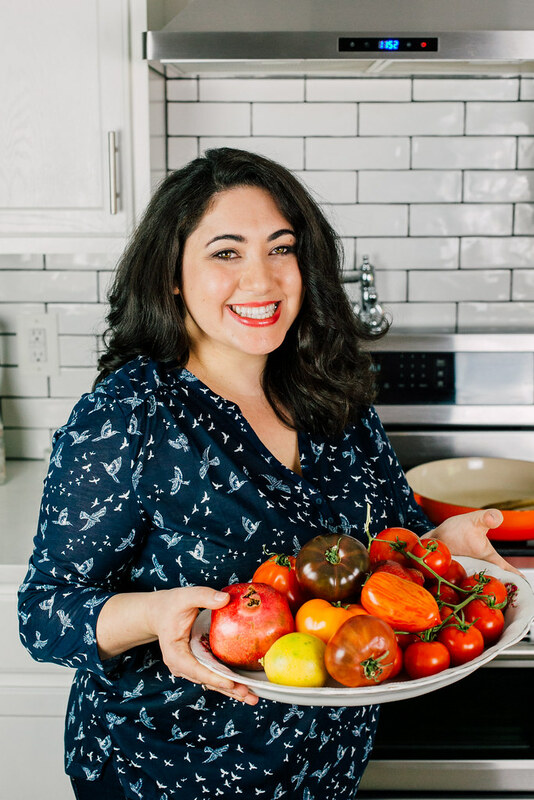 I am not from a Persian family, but I have dreams of hosting a lavish Persian dinner someday. A full table with bright colors of yellow and orange, from saffron and turmeric. With specks of pink and red from pomegranate topped vegetables and jeweled rice. Definitely one day. But for now, I shall share some of my favorite flavors when I can and in smaller form. 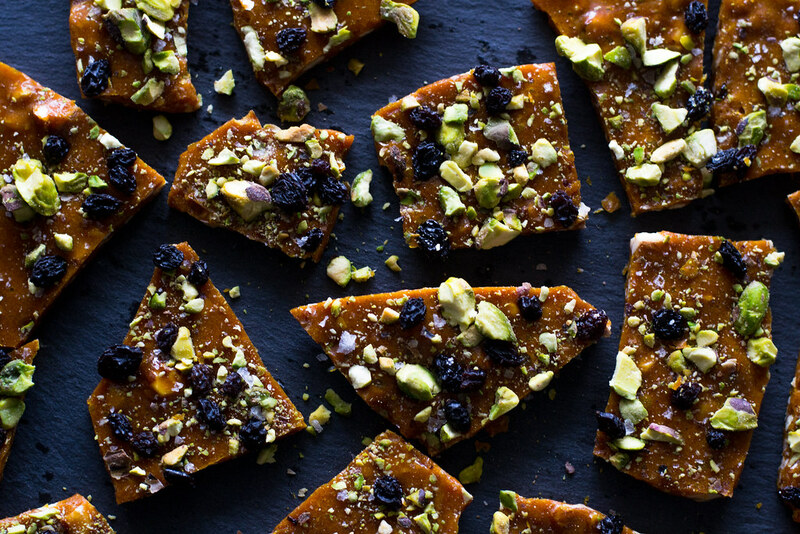 Like I said, I first saw this recipe on Bon Appetit and was enamored by the thought of a sweet and sticky brittle yet flavored with floral rose water, saffron and pistachios. I did make some changes, as the original recipe asked for dried rose petals which I couldn’t find so instead added dried currants. The bit of rose water that is added gives the perfect amount of perfume without overpowering. Persian New Year is in a few days and I believe this would be a fabulous last bite of something sweet after a beautiful Persian dinner. First line a baking sheet with parchment paper and then spray non-stick cooking pray on the paper to make sure nothing sticks. In a small bowl, add the saffron and rose water and allow to steep. Next in a medium pot, bring sugar, corn syrup, honey and 2 Tb water to a boil and fit the pot with a candy thermometer over medium heat. Stir gently to dissolve the sugar but once it's dissolved, stop stiring. Continue to cook until 290 degrees Fahrenheit. Be very careful because mixture will be very hot! Once it reaches temp, stir in the almonds and butter, stiring often with a spatula until almonds are lightly golden. Once it gets to 300 degrees, then quickly whisk in the baking soda and saffron mixture. The caramel will bubble but just keep stirring carefully until it becomes smooth. Then pour mixture onto the greased baking sheet and use your spatula to spread it out evenly. Top with currants, pistachios and flaky sea salt and allow to sit for a minimum of 30 minutes. Once done, the brittle will not be hot and you can use a mallet to break it into pieces. Fruit Rose Tart with Rose Whipped Cream + Cookbook is HERE + Giveaway! 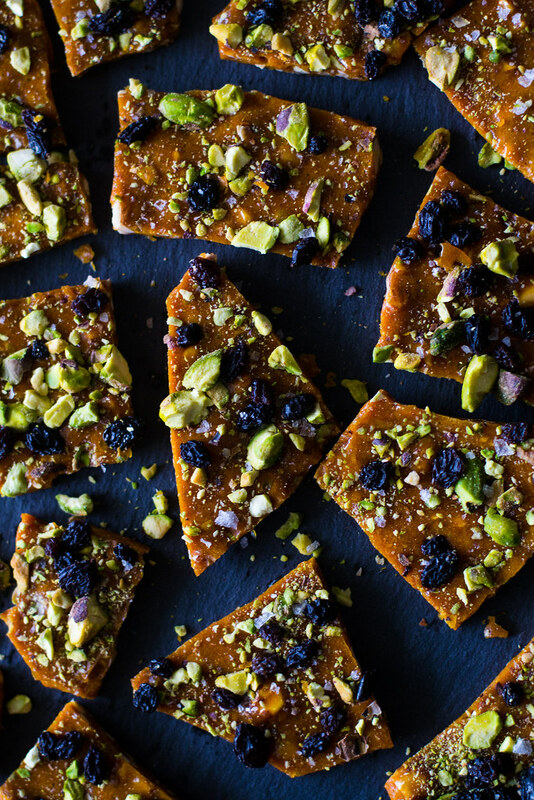 Saffron and Pistachio Brittle in your pictures look so yummy. Will make it this weekend. Thank you for sharing this recipe. Please keep it up.